BIBB / Open and closed occupations in Germany – what is the significance of formal professional and vocational qualifications? This article investigates the question to which extent occupations are exercised even if training has not been completed or if a qualification in a different field is held. The opening up of occupations may represent an opportunity for various groups within the population which otherwise find it harder to access the employment system. Nevertheless, this also raises issues with regard to the quality and attractiveness of occupations. The article concludes by exploring possible consequences. What is meant by open and closed occupations? “Occupational closure” (WEEDEN 2002) describes the establishment of “barriers” to occupational positions in order to restrict access or the labour supply. Professional and vocational qualifications are an example of such barriers. In Germany, the training and employment systems are closely linked. Dual training occupations follow curricula agreed by the employer and employee sides. To this extent, the expectation is that occupations with a medium requirements level will mainly be performed by persons who have undergone training in the relevant occupation or who are at least in possession of a formal vocational qualification. The question of how open or closed occupations are is connected with the topic of inclusion and with the themes of skilled worker shortages and the attractiveness and quality of occupations. 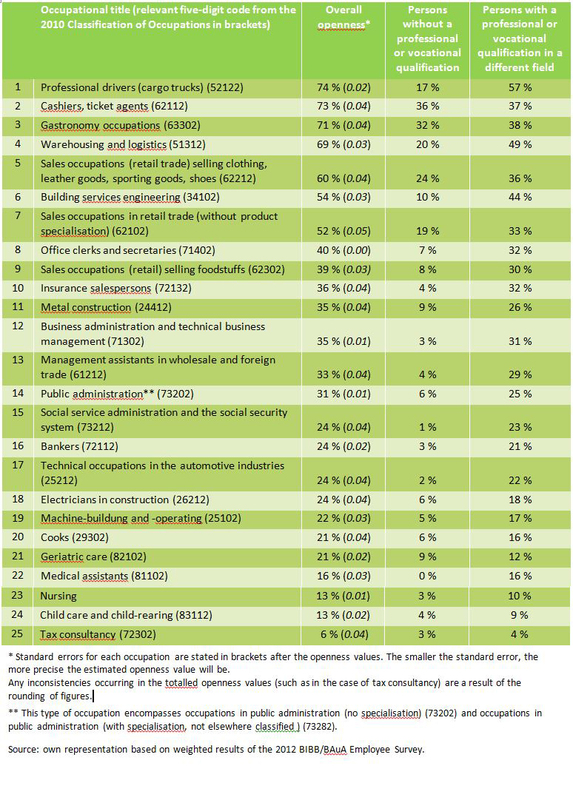 How open are occupations in Germany? Via the proportion of persons employed in an occupation who have not completed professional or vocational training. Via the proportion of the labour force in an occupation which has completed training in a different field. Training in a different specialism is assumed if respondents state that the training they have completed no longer has any connection with the job activity exercised. Adding these two proportions together gives a value for the openness of an occupation in overall terms. Because the following results are based on a sample survey, the openness values should be seen as broad benchmarks and guidance values rather than as precise population figures. The table shows very different levels of openness according to occupation. 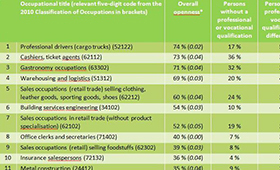 Professional drivers (74 %), cashiers and ticket agents (73 %), gastronomy occupations (71 %) and warehousing workers (69 %) all exhibit values of around 70 per cent and can be identified as particularly open occupations. By way of contrast, tax consultants (6 %), childcare workers (13 %), nurses (13 %) and medical assistants (16 %) all have scores of under 20 per cent and may be described as highly closed. The concentration of healthcare and education occupations, which all display a high degree of closure by qualification, is noticeable. Several occupations (such as registered general nurse and state-certified nursery school teaching occupations) are regulated professions in Germany and are linked to the possession of certain qualifications. Other possible explanations of high closure values include a sufficient supply of qualified workers, meaning that the opening of an occupation becomes less necessary. Employers and associations may also attach great importance to the demonstration of formal qualifications in some occupations and branches. On the other hand, it is conceivable that some occupations are opened up to those without qualifications in a targeted manner, for example employing non-qualified interns or students to provide support. This is an area in which more detailed analyses and surveys at individual occupation level will be required in the future. For this reason, it is useful to look at the openness of occupations separately in accordance with the categories of persons without a professional or vocational qualification and persons with a professional or vocational qualification in a different field. It is, for instance, conspicuous that many professional drivers hold a vocational qualification but have completed training in a different field. On the other hand, around a third of cashiers, ticket agents and gastronomy service staff have no full vocational education and training qualification. What are the consequences of the openness of occupations? In overall terms, the analyses show that, in most occupations at the medium requirements level, the proportion of unqualified persons or persons who have completed training in a different field tends to be low. Nevertheless, occupationally-specific differences are discernible. How can this be categorised in socio-political terms? If it is possible to exercise occupations without a relevant qualifications certificate, this will be advantageous to certain population groups. Firstly, it enables those without qualifications to perform an occupation. This is an educational group in which the unemployment rate today is far above that of persons with a professional or vocational qualification. Secondly, persons who can no longer find employment in the occupation in which they have been trained because of rationalisation processes are able to switch to open occupations. Thirdly, workers who have acquired their qualification abroad may find it easier to gain a foothold on the German labour market. This is also of major importance against the background of the debate surrounding the integration of refugees. The opening of occupations does not, however, solely produce benefits. The issue of the attractiveness of (training) occupations emerges if unqualified persons or persons qualified in different fields are employed because no appropriately qualified skilled workers are available. An increase in the number of unqualified workers in an occupation also brings the threat of a loss of quality and prestige. Alongside differentiated analyses at occupational level, future research will need to examine the intriguing question of whether the opening of occupations leads to reduced wages for employees. Another interesting issue is whether persons with academic qualifications will displace those who have completed dual or full-time school-based training.